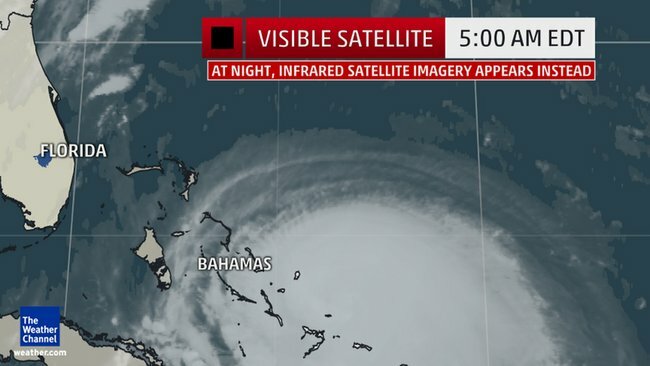 Hurricane Joaquin strengthened to major hurricane status as a Category 3 storm Wednesday night, as it moves dangerously close to the Bahamas, and prospects are looking increasingly worrisome for the U.S. mainland as the official forecast raises the odds of the East Coast seeing its first landfalling hurricane in 15 months. Joaquin will pass dangerously close to Samana Cays island through Thursday morning, moving toward Rum Cay and San Salvador islands later Thursday. With the Category 3 hurricane passing close to the islands at a relatively slow speed, and perhaps even intensifying to Category 4 status, a catastrophic situation may unfold there with a prolonged period of intense hurricane conditions. 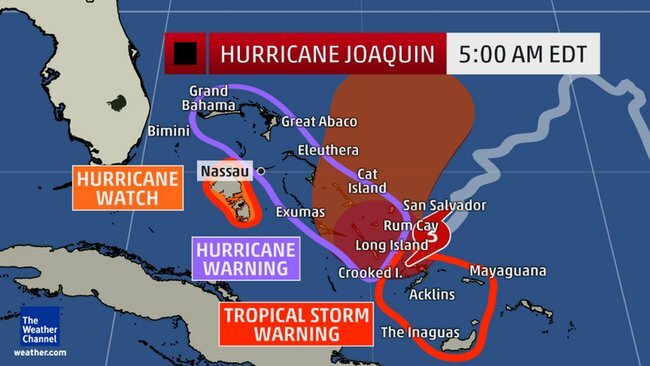 Hurricane warnings have been expanded to include more of the Bahamas as Hurricane Joaquin churns toward the nation of islands east of Florida. An Air Force Reserve Hurricane Hunter reconnaissance aircraft flying through Hurricane Joaquin Wednesday night found winds near the center had become much stronger, prompting the agency to raise the wind figure to 105 mph in the 8 p.m. advisory and 120 mph at 2 a.m. Thursday. 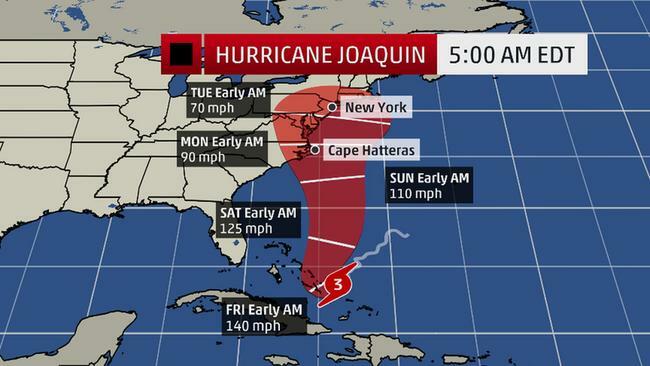 The latter makes Joaquin a Category 3 hurricane on the Saffir-Simpson Hurricane Wind Scale. Equipment on the plane measured surface winds as high as 130 mph in gusts within powerful thunderstorms in the developing eyewall in the still-growing tropical cyclone. With Joaquin's winds strengthening by a factor of 30 mph within a 24-hour period on Wednesday, rapid intensification criteria has been met. Further strengthening is expected Thursday. Hurricane Joaquin continues to intensify as wind shear – harmful to the intensification of tropical cyclones – lessens, and a complicated atmospheric pattern makes its future track – including any potential landfall on the U.S. East Coast – extremely difficult to forecast. Residents along the East Coast of the U.S. should pay close attention to the forecast now through this weekend. It's a particularly difficult forecast that hinges on the behavior of several different atmospheric features over North America and the North Atlantic Ocean. Joaquin's future depends critically on the position and relative strength of those players – not to mention its own strength. Strong wind shear had kept most of Joaquin's thunderstorm activity (convection) south or east of its center of circulation, but that changed Tuesday afternoon and evening as thunderstorms developed closer to its circulation center. That trend continued unabated Wednesday, transforming Joaquin into a powerhouse of a tropical cyclone by the end of the day. A hurricane warning remains in effect for the northwestern Bahamas including the Abacos, Berry Islands, Eleuthera, Grand Bahama Island, and New Providence. This includes both Nassau and Freeport. A hurricane warning remains in effect for the central Bahamas, including Cat Island, the Exumas, Long Island, Rum Cay and San Salvador. A hurricane watch remains in effect for Bimini and has been expanded to include Andros Island. A tropical storm warning is now in effect for Andros Island as well. A tropical storm warning continues for the southeastern Bahamas including the Acklins, Crooked Island, Long Cay, the Inaguas, Mayaguana, and the Ragged Islands, but excluding the Turks and Caicos Islands. 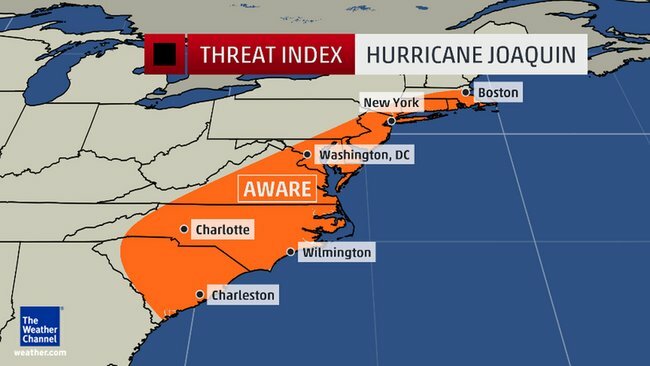 Hurricane preparations should be rushed to completion in the hurricane warning area. Joaquin will slowly churn toward the central Bahamas Thursday. The storm will eventually make a sharp right turn and head north sometime Friday, but it's already too late for that turn to spare the Bahamas from dangerous impacts. At this time, we expect some of the worst impacts in the Bahamas to occur on San Salvador and Rum Cay, where the eye of Joaquin is likely to pass nearby or overhead late Thursday or Thursday night as the hurricane peaks in intensity, potentially as a Category 4 storm. Other islands in the central Bahamas may take a direct hit as well depending on the timing of Joaquin's turn. Catastrophic wind damage: Sustained winds up to 140 mph are forecast, with gusts to 165 mph. Even well-built homes may lose their roofs and even experience failure of one or more exterior walls. Most trees will be snapped and many uprooted. Given the small size of the islands, the electrical grid will likely experience a complete blackout and may be partially or completely destroyed. Recovery may take weeks or months. Dangerous storm surge and waves: In areas where the wind blows toward shore, water levels may rise 5 to 8 feet above normal tide levels, flooding low-lying coastal areas. Extremely high waves from the open ocean may then damage or destroy any structures flooded by seawater. Extreme rainfall: Rainfall totals in excess of 20 inches are possible, leading to potentially life-threatening flash flooding. Storm surge and the generally low elevations of the islands will greatly limit the ability of rainwater to run off into the ocean, further aggravating the situation. The northwestern Bahamas, including Nassau and Freeport, are less likely to encounter Joaquin's dangerous core – but may still see hurricane conditions develop later Thursday into Friday. Although computer model simulations have had the advantage of ingesting high-resolution real-world data from Air Force reconnaissance flights into the hurricane, in addition to NOAA flights capturing detailed atmospheric measurements in the hundreds of miles of atmosphere surrounding Joaquin, it doesn't seem to have brought them much closer to a consensus. The American GFS model forecast continues to show Joaquin making an alarming northwestward turn, slamming it right into Virginia, Maryland or North Carolina this weekend. 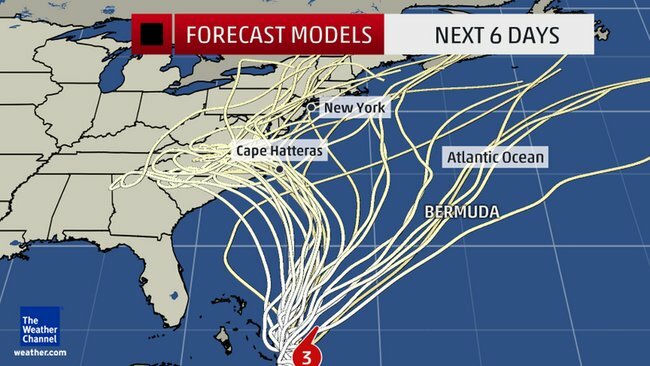 Meanwhile, the European ECMWF model suggests Joaquin has a chance of staying away from the U.S. East Coast. It is simply too soon and the uncertainty is too high to be confident about specific impacts from Joaquin itself for the U.S. East Coast at this time. The National Hurricane Center's official forecast cone is below. The official forecast remains a compromise between the competing scenarios from the computer models. Note that the official intensity forecast now brings Joaquin to Category 4 strength in the Bahamas Thursday night, capable of causing catastrophic wind damage. Regardless of the ultimate outcome of Joaquin's path, portions of the East Coast will still see multiple impacts from the evolving large-scale weather pattern, including flooding rainfall, gusty winds, high surf, beach erosion and some coastal flooding. Click the link below for more information on that story. 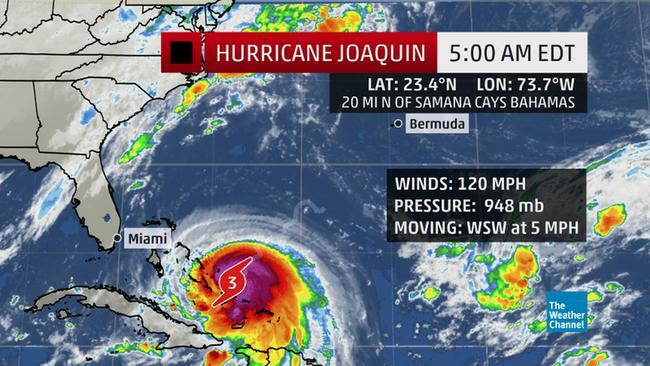 Hurricane Joaquin's center is located about 80 miles east of San Salvador in the central Bahamas. Maximum sustained winds are estimated at 120 mph, a Category 3 hurricane on the Saffir-Simpson hurricane wind scale. Joaquin is undergoing rapid intensification that may bring it to Category 4 intensity sometime Thursday. This system is moving slowly to the southwest and this is expected to continue through Thursday before turning north Friday into Saturday. Hurricane watches and warnings are in effect for a large part of the Bahamas, where life-threatening conditions are expected in some areas. Joaquin may directly or indirectly affect the East Coast late this weekend or early next week, and a landfall is possible. 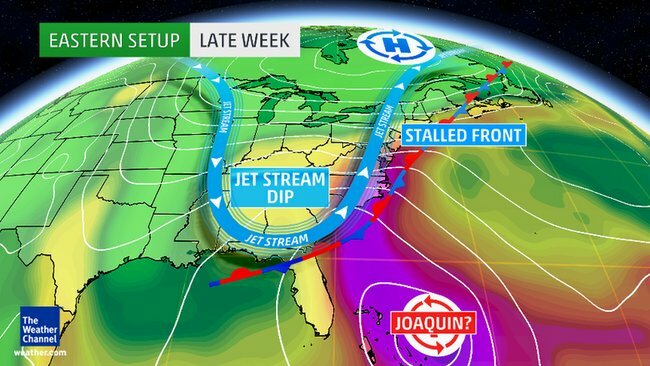 Moisture and/or energy associated with Joaquin could enhance rainfall along the cold front in the Northeast late this week. Regardless, the East Coast will see significant impacts from the larger scale weather pattern taking shape.